Rock & Roll Hall of Famer Sammy Hagar will be joining forces with Michael Anthony, Jason Bonham and Vic Johnson on his “A Journey Through The History of Rock” tour, presented by Sammy’s Beach Bar Rum. Fans will have a rare opportunity to experience music spanning more than 40 years of Hagar’s career -- and with Jason Bonham on board, they can also expect a few of Led Zeppelin’s biggest hits added to the mix. Experience the journey! Amazing performance of Dreams, just Vic and Sammy... Tahoe is a special place to see Sammy! Hope you enjoyed the show, it was awesome! What a great show!! Loved hearing the Zep tunes. Hi! Do you still have your tickets? Me and the wife are traveling cross country to Tahoe this weekend to celebrate me turning the Big 50--Red Rocker style!!! Can't wait!!!!!! Hey Sammy, Whats the possibility of throwing in some old school songs in Tahoe like, "Back into you", "What They Gonna Say Now", "Your Love is Driving me Crazy", "Baby's on Fire"? Or just a few random songs you normally don't do live. Anyone else up for these, or am I just a crazy fan? Takin My Teenage Boys to their 1st Concert! Sure beats my first concert w Kool & the Gang... I hope they remember it forever! 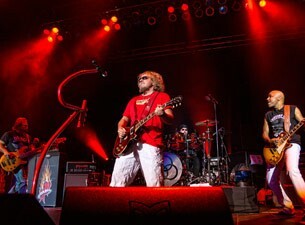 It doesn't matter the name of the band when you're a Sammy Hagar Fan! Whoops! Too Mas Tequila! Seen Sammy in Idaho Falls into the 90's, not the 80's!!! There goes that idiot thing again! Sammy's THE MAN!!! Seen him back in the 80's in Idaho Falls and he played a boat load of Montrose, and I thought he ruled! Then I seen him in Nampa back in like '05, and he actually played a song for me! I was this dumb douche in the audience that didn't realize that "Bad Motor Scooter" was Sammy's song, and I'm screamin' "Rock Candy, play Rock Candy"! And he did! Not that "Rock Candy"s bad by ANY means, and not that it's not Sammy's song, it's just that I would have felt like less of an idiot had I realized Sammy made "Bad Motor Scooter" and screamed for that song. That's his signature of that era. But Sammy, being THE man, played "Rock Candy" for me! For me! Some dude in the audience smacked me on the arm and said "He' playin' that for you"! I had to untuck my shirt so nobody'd notice!!! Then I'm not so sure that he didn't see me (least I'd like to think so) when I seen him in Jackpot in like '13, and he played both!! I'd like to think he did that for me, although I'm just a nobody,AND he did play a span of music, from Montrose, to VanHagar, and everything in between and beyond. Nobody's EVER crossed my path, least not a famous one, that has ever been that cordial to me, and I think it's ABOUT time I said Thank You! Thank you Sammy, from the heart, and I can't wait to rock in Tahoe in September!! You'll know me, cuz I'll be screamin' my guts out like always. Hope you'll play "Bad Motor Scooter". Your simply THE MAN!!! We are going back to see Sammy in Lake Tahoe! We've seen him in Milwaukee, St. Louis and Chicago. Been to Tahoe Wabo often and now get to see Sammy in the most beautiful place in the USA. You can also use "total" for the total rewards password. Got my tix! SSOOOO excited! You can get through with "redhead" for the fan presale and "beach" for the APE presale. Neither site will take the "beach" password? 3x the fun I'll be there again! Is this show 18 and over? I'd love to take my son! Now if I could just get drawn for Cabo this redhead will be stoked.